Turn to Section 3 of your answer sheet to answer the questions in this section. 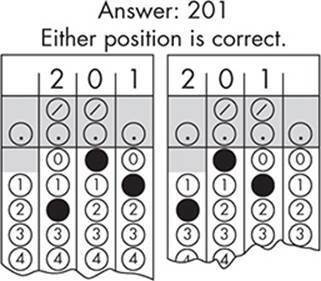 For questions 1–15, solve each problem, choose the best answer from the choices provided, and fill in the corresponding circle on your answer sheet. For questions 16–20, solve the problem and enter your answer in the grid on the answer sheet. Please refer to the directions before question 16 on how to enter you answers in the grid. You may use any available space in your test booklet for scratch work. 1. The use of a calculator is NOT permitted. 2. All variables and expressions used represent real numbers unless otherwise indicated. 3. Figures provided in this test are drawn to scale unless otherwise indicated. 4. All figures lie in a plane unless otherwise indicated. 5. Unless otherwise indicated, the domain of a given function f is the set of all real numbers for which f(x) is a real number. 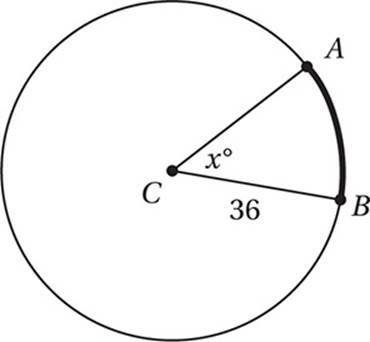 The number of degrees of arc in a circle is 360. The number of radians of arc in a circle is 2π. The sum of the measures in degrees of the angles of a triangle is 180. If 6x + 9 = 30, what is the value of 2x + 3? A system of two equations and their graphs in the xy-plane are shown above. How many solutions does the system have? A total of 300 tickets were sold for a performance of a school play. The ticket prices were $5 for each adult and $3 for each child, and the total revenue from tickets was $1,400. Solving which of the following systems of equations would yield the number of adult tickets sold, a, and the number of children’s tickets sold, c? Which of the following expressions is equivalent to 2(x − 4)2 − 5x? 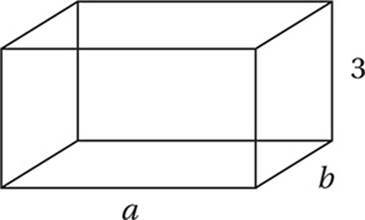 A rectangular solid above has dimensions 3, a, and b, where a and b are integers. Which of the following CANNOT be the areas of three different faces of this solid? The cost in dollars, C, to manufacture n necklaces is given by the equation C(n) = an + b, where a and b are positive constants. In this equation, what does a represent? 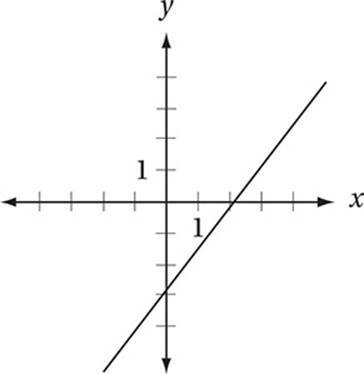 Line l intersects the graph of the function f(x) = 2x2 − 4x + 1 at two points where x = −1 and x = 2, respectively. What is the slope of line l? Which of the following equations represents a parabola in the xy-plane with a vertex that lies on the x-axis? In the mesosphere, the atmospheric layer between 50 km and 80 km in altitude, the average atmospheric temperature varies linearly with altitude. If the average temperature at 50 km altitude is 10°C and the average temperature at 80 km is −80°C, then at what altitude is the average temperature −50°C? The graph of the equation y = 2x2 − 16x + 14 intersects the y-axis at point A and the x-axis at points B and C. What is the area of triangle ABC? 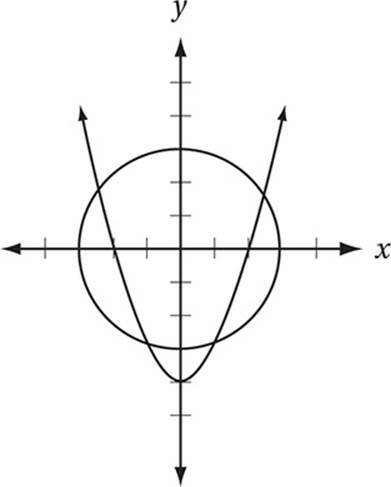 What is the total number of x- and y-intercepts in the graph of the equation y = (x + 2)2(x − 3)2? If the complex number A satisfies the equation A(2 − i) = 2 + i, where , what is the value of A? 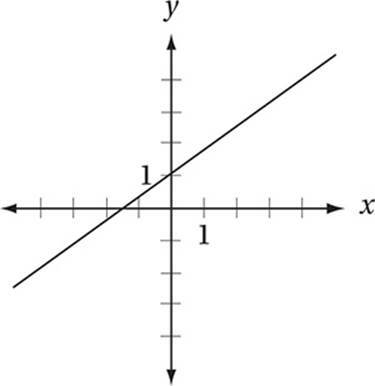 If k > 2, which of the following could be the graph of y + x = k(x − 1) in the xy-plane? The function g(x) = ax3 + bx2 + cx + d has zeroes at x = –2, x = 3, and x = 6. If g(0) < 0, which of the following must also be negative? For questions 16–20, solve the problem and enter your answer in the grid, as described below, on the answer sheet. 1. 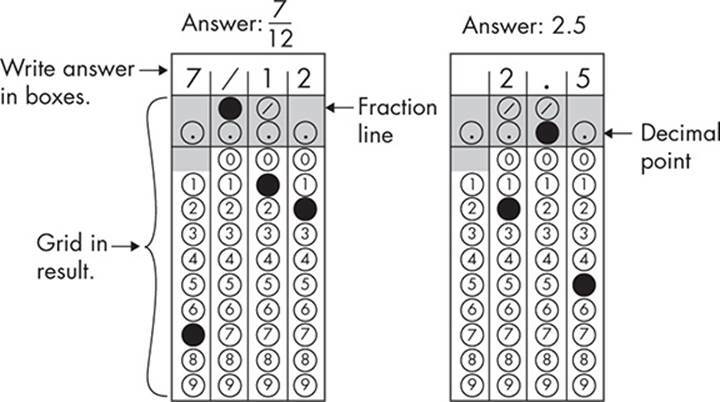 Although not required, it is suggested that you write your answer in the boxes at the top of the columns to help you fill in the circles accurately. You will receive credit only if the circles are filled in correctly. 2. Mark no more than one circle in any column. 3. No question has a negative answer. 4. Some problems may have more than one correct answer. In such cases, grid only one answer. 5. 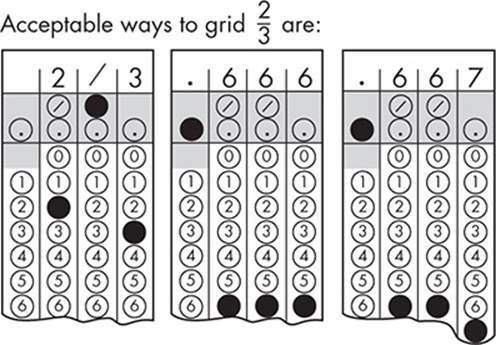 Mixed numbers such as must be gridded as 3.5 or . (If is entered into the grid as , it will be interpreted as , not ). 6. Decimal answers: If you obtain a decimal answer with more digits than the grid can accommodate, it may be either rounded or truncated, but it must fill the entire grid. If , what is the value of 4x + 3y? 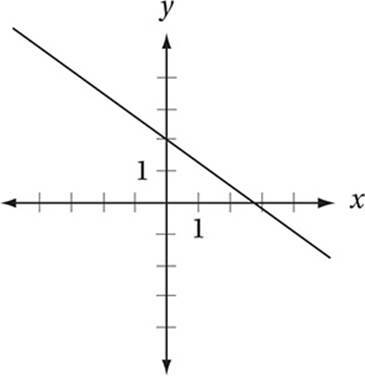 If , what is the value of x? Note: Figure not drawn to scale. In the circle above, arc AB has a measure of 7π. 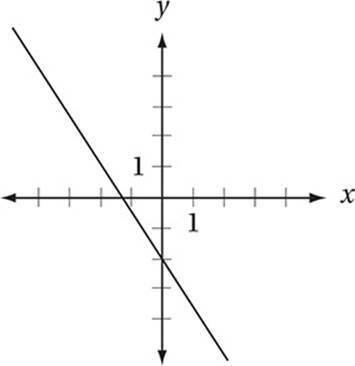 What is the value of x? For what value of k will the system of equations above have at least one solution? If x represents the radian measure of an angle, where , and , then what is the value of ? If you finish before time is called, you may check your work on this section only. Do not turn to any other section of the test.